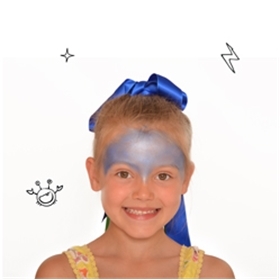 Using a damp sponge, apply sparkle blue paint above the eyebrows and across the forehead to a point at the top of the nose. 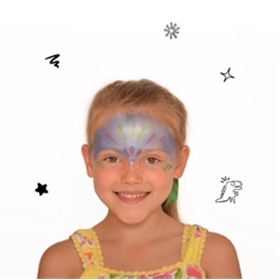 With sparkle lilac paint, paint teardrop shapes in between the eyes and on either side of the forehead. With sparkle green, paint shapes in the middle of the forehead and below each eye. Using pale pink paint, add dots with the tip of the brush. 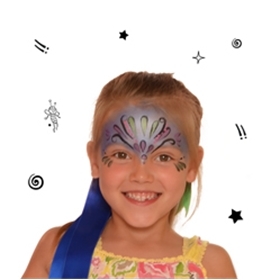 Using a fine brush, create swirls on the forehead and outline the edge of all the shapes with black paint. Finish with lots of glitter!